From a young age growing up in New Hampshire, I have been fascinated with how light reflects and refracts in nature … fresh fallen snow, twinkling stars, morning dew, spider webs, and rainbows. 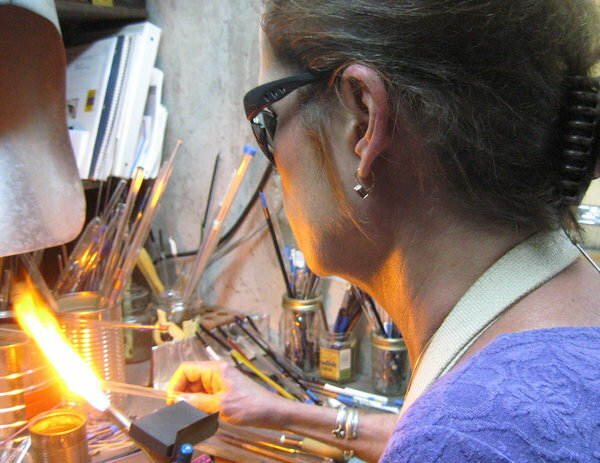 Glassblowing and lampwork presents unlimited possibilities to play with light in fluid and creative ways. The range of glass colors provide a palate that emulates those found in nature. Metalsmithing was taught to me by my mother. In my early teens, I tutored with world renowned jewelry designer Gilbert Oakes whose work has been exhibited in the Smithsonian Institute. More than 40 years later, I am still fascinated by the fluidity, malleability, strength, and light reflection of silver and offer that work as custom designed water-cast silver jewelry. I started working with cremation ashes as a favor for a friend. It took several attempts to perfect the implosion process of setting the ashes within the design. I have found that the designs capture the essence of the person or pet. While I am working with the art pieces, I frequently sense the persona which comes through into the design. I work with borosilicate glass (a strong, high quality glass) because it joins well with the cremation stardust of our loved ones and beloved pets. Every piece of memorial or cremation glass presents a unique expression of light and form in a sealed glass piece of lasting art.